Are you frustrated that your spells don’t seem to work? A lot of people new to the Craft find it difficult to cast spells that really give results. In fact, many who have practised a while find it hard too! When Amaris was creating the Book of Shadows on this website, she was often asked by readers why some spells didn’t seem to work, and what they needed to do in order to become a real practising witch and/or Wiccan. The truth of the matter is, real witchcraft is all about learning how to manipulate energy. In order to cast spells that work, you need to really get in tune with this magickal energy that flows through all of us. Anyone can do it, if they’re only taught how! Have you ever wondered how Magick can improve your life? The good news is, that by learning about energy and how it works, not only do your spells start becoming more effective, but everything in your life becomes better! If you work with these energies in the right way, you create balance and harmony within yourself, which is mirrored by the world around you. Work towards creating the life of your dreams! 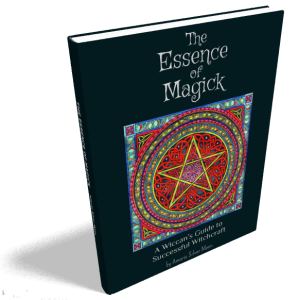 The Essence Of Magick is not just a simple introduction to the general principles of magick. It’s much more than that. What you get is a step-by-step, in-depth guide to successful witchcraft by Amaris, a practising witch with more than 15 years’ experience in Wicca and the esoteric arts. Learn how to work with magickal energies and start creating the life you’ve always dreamed of today! If you have any queries about your purchase, please contact us.